MegaPack™ for Soybeans innoculant is a low volume liquid formulation that drastically reduces seed bridging and sticking, especially when applied with seed fungicides or insecticides. It contains three times the Rhizobia, and goes on at about a third of the application rate, as standard liquid formulations. MegaPack™ for Soybeans contains the same triple stack Rhizobia strain package found in America’s Best Innoculant®, for top yield responses. This strain package was developed by the best minds in Rhizobium genetics and is backed by research and scientifically proven test plot results. MegaPack™ for Soybeans has one of the lowest application rates available to keep treated soybean seed flowing. Only 0.6 fl. oz per 50 lbs. soybean seed. 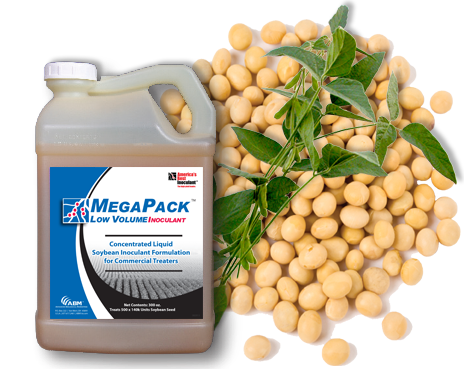 MegaPack™ for Soybeans is conveniently packaged in a 2.5 gallon jug.